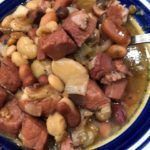 Ham and bean soup is one of my families favorite recipes to enjoy year round. 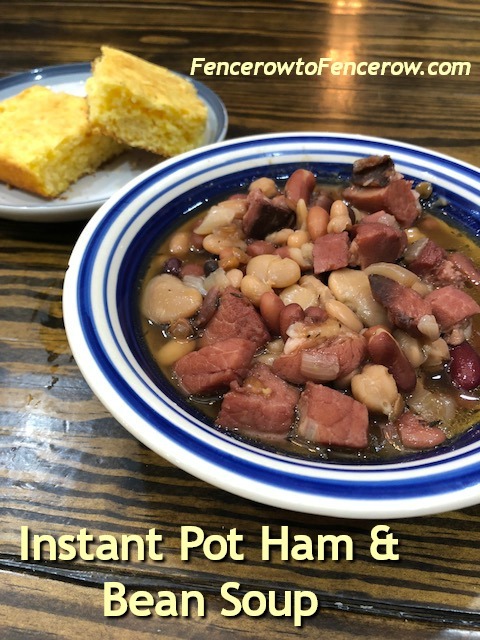 I’ve always made ham and bean soup in the Crockpot, but now do it in my Instant Pot. 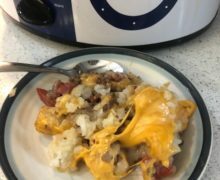 When you make it in the Instant Pot soup tastes like it cooked all day! I love soup. No matter what the weather, I could eat soup. Remember my trip to Mexico where I discovered I love Pork Pozole Soup? I had to go home and make it immediately! Maybe you like chili? My Mexican Crockpot Chili is a family favorite! 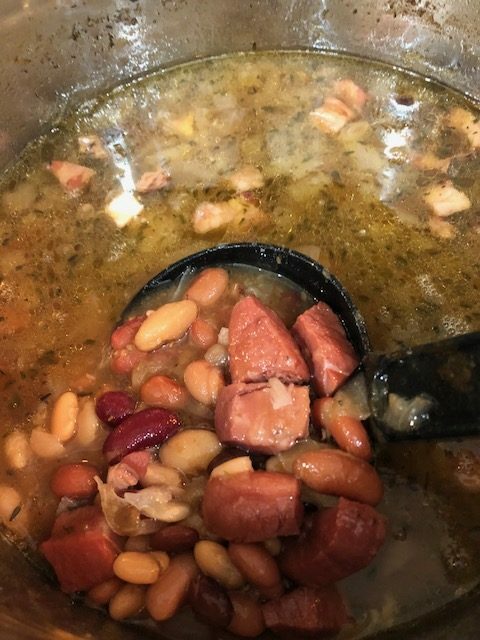 Ham and Bean Soup should be eaten with cornbread! I rarely make from scratch cornbread. 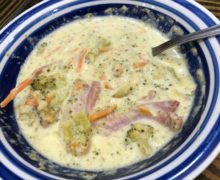 This soup was enjoyed with a box of Jiffy Mix cornbread! I love my Instant Pot. I have an Instant Pot Duo80 8 quart pot. It is a great time saver for busy families or nights you get home late and need to get a meal cooked quickly! This soup is so easy. There is very little prep involved. And it will make your kitchen smell so good! Do you have a favorite Instant Pot recipe? Let me know what it is! And give this simply Ham and Bean Soup a try. You’ll love this soup! And you’ll have leftovers for the next day! A comfortable, filling, easy soup that your whole family will love! Place all ingredients in your Instant Pot or electric pressure cooker. Cook on high manual pressure for 40 minutes. 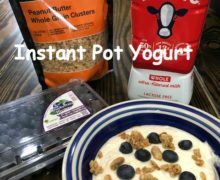 Let the Instant Pot do a natural release. Season with salt, pepper and extra hot sauce to taste. Disclaimer – The article contains affiliate links. Should you want to support our farm life, please click the links! Welcome to my mess! My blog has been undergoing an overhaul and it is taking longer than I ever anticipated. If you are visiting for the first time, please be patient as the blog will look great in a month! Last week was a bit of a rough week. Tragedy hit some people around me. I spent the good part of a week sitting in a meeting, which wasn’t rough. Just tiring!! Friday had me running in a few directions trying to educate people about agriculture, both young and old. Overall, just a tiring week! So while I could have slept on Saturday, I decided to recharge my batteries and meet up with my bloggy (and real life) friends from The Real Farmwives of America to do some freezer cooking! Freezer cooking involves cooking in large quantities and sharing those meals. I’ve done this type of cooking on numerous occasions and really appreciate the meals during the busy crop harvest days ahead! 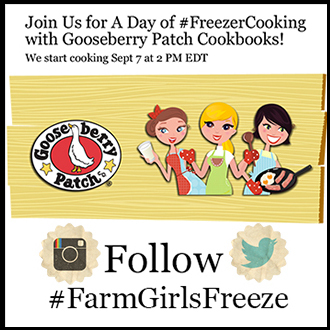 Our friends at Gooseberry Patch offered me their new cookbook, Freezer Friendly Recipes, for some cooking ideas. I chose Mexican 3-Bean Soup as my item to make. The recipe is truly a dump, stir and heat type of meal. Perfect for my crazy week and inability to grocery shop, plan or really do much ahead of time. Start by browning your hamburger. My dear friend, Heather at 3 Kids and Lots of Pigs saved me with her fancy Pampered Chef steamer. Stick a pound of frozen hamburger in this thing, microwave for 8 minutes, and it’s brown! I was having a horrible time getting my meat defrosted and was so grateful for this little device! Although I did have 11 pounds of hamburger to defrost. It took awhile! 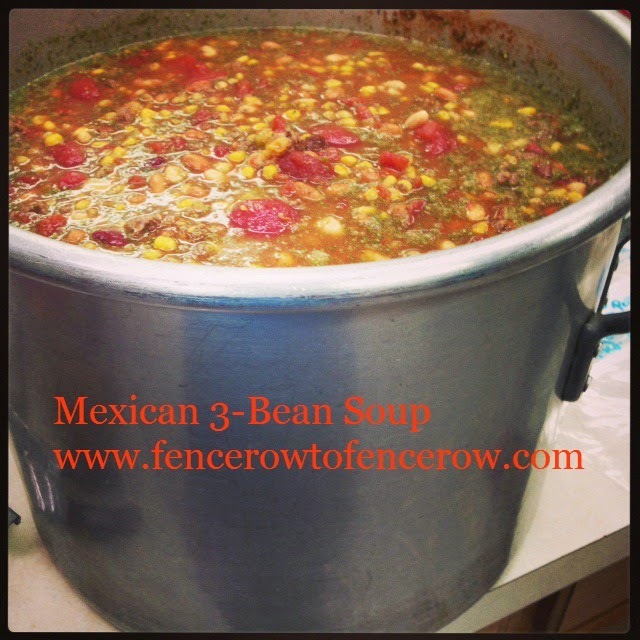 In a soup pot, stir together the hamburger, a chopped up onion, kidney beans, pinto beans, navy beans, corn, stewed tomatoes, tomatoes with chilies, a package of taco seasoning, and a package of ranch salad dressing mix. Simmer and serve. That’s it!! How much easier can it be? Brown beef and onion over medium heat. Drain. And undrained beans, corn, tomatoes and seasoning mixes. Simmer and serve! This picture only shows half of what I made! This made 11 gallon size freezer bags of soup. 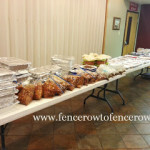 I had just enough left over totake some home for our Sunday after church lunch. I served it with sour cream and cheddar cheese. It was a big hit in my house! And just how much did we cook? This picture should tell the story! 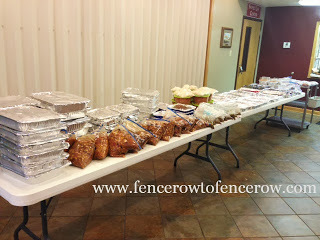 There were a lot of meals to take home! I can’t wait to dig in to them and share them with my family. I encourage you to grab a group of friends and try some mass cooking. It is such a great time! I got to catch up with my favorite people and take home food as well. And I’ve stirred up interest with another group of friends who want to try this as well! So I may be making this recipe for a whole new group of people later this fall.